When I first saw “Gold Room Scotty”, or “Scotty” as he is referred to, we were stabled next to him at a dressage show at Willowbrooke Farms in Plymoth, MI. A student of mine, Sara, walked right next to his Dutch door stall and started petting him. This big, lanky, bay gelding put his head down for the young girl so it was easier for her to reach him. He had a kind look in his eye, and almost seemed to fall asleep as she stroked his forelock, he even pressed his head into her little hand to heighten the effect of the scratch. Yet, he didn’t do it so much as to be rude, he seemed to know she was small. It didn’t take long for me to figure out Scotty was a CANTER horse, as most of them were stabled at Willowbrooke, awaiting new homes. CANTER is a Thoroughbred rehoming organization that acts as a liaison between track owners and potential Thoroughbred adoptees. The horses are donated to or bought by CANTER from the track, and then potential adopters are vetted by the organization. Veterinarian, farrier, and personal recommendations are checked before an adoption can take place. When I looked at Scotty formally, I was further impressed by his calm demeanor. This was exceptional considering he was only 4 and his last race was a few months before in September. The main reason I looked at Scotty was because I was interested in going the Retired Racehorse Project’s Thoroughbred Makeover. Or, “the makeover” as it is called by its participants. The makeover is a training competition very similar to the “Mustang Makeover” but with a few key differences directed especially to Thoroughbreds. Trainers are approved by the Retired Racehorse Project (RRP), showing evidence and references that they would have the knowledge and support system to retrain a recently off the track Thoroughbred. Trainers can train or purchase any Thoroughbred Racehorse, tattooed and registered with the Jockey Club that has published race work after July 1st 2016 and cannot have had more than 15 allowable retraining rides before December 1st 2017 for the 2018 makeover. Once the trainers have acquired their horses, they have 10 different disciplines they can choose from to retrain. The trainers must declare which disciplines they are going to do by August of 2018 and the makeover is the first week in October. With these criteria in mind I took in Scotty’s chill attitude and willingness to try as I did some groundwork with him. After our session my mind was thinking he could do the freestyle, which is what I wanted to do. Also, with his long, flat, graceful strides I figured he could be a nice hunter jumper as a backup plan. I was confident that I could train this horse and that he had considerable resale value in the English Market. After all, he was 16.2, bay, and a gelding with a nice attitude, I filled out my adoption application, got approved, paid the $1,200 adoption fee and took Scotty home. I start or restart all of my horse’s in a round pen and Scotty took to it very quickly. During groundwork he had a bit of troubled shortening his strides to match mine while walking, moving his shoulder and hips separately when asked, backing up, and being on the right side while walking. This all made since of course, because on the track he is going forward in a straight line as fast as possible on the left side. In about two weeks though he was a lot more tolerant to these things and improved exponentially just about every time I worked with him. I was really stuck with how smart, willing, and earnest he was. 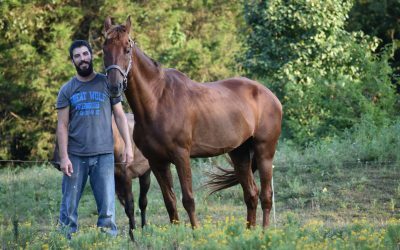 When it came time to do the ridden work, Scotty did what a typical off-the-track-Thoroughbred or OTTB would do: he pulled at the bit. It was pretty significant actually, he would pull forward to just about any pressure, especially backwards, and usually that pulling ended up going down to the ground. If I kept a steady hand, he would just pull harder. Giving alternating pressure made no difference, he didn’t even seem to get it when I would one rein stop him every time he pulled. Not wanting to create a habit I did something some might call unconventional – I rode him in a rope halter. The first day of riding in the rope halter I got about a 50% better response from him, way less pulling. The second day 75% better and the third day he was like a normal horse. All of this done with a regular rope halter with clip on split reins on the bottom of it. The fourth day I was able to get him to back-up under saddle, something I had previously only been able to do from the ground. By the end of the week we were neck reining walk, trot, and canter on a loose rein in the rope halter. Two weeks later we were able to reintroduce the bit. Now with the bit Scotty still wasn’t ready to try and ride on the vertical and attempt to carry himself in a frame, but he did ride on a loose rein very, very well. It wasn’t long before I would take him out on the trails and he would lead. We went through water up to his chest, over bridges, past kayakers, megaphones, and Boy Scouts. We went to a spooky object clinic and Scotty was the calmest horse there. He didn’t spook at one obstacle. Everyone was astounded that he was an OTTB. On the trails we would meet with other trail riders and discuss the makeover and the RRP’s Mission to increase the demand for Thoroughbreds by showing people what they can do when retrained properly. Scotty turned out to be a pretty good ambassador for the bred! When August finally came around, I wasn’t sure what event we should pick at the makeover. I wasn’t confident in the freestyle routine yet, I wanted to ride without a bridle and while I knew Scotty could do it, I wasn’t sure he could do it in a competition setting yet. Much less at the Kentucky Horse Park where the makeover is held and in the dome-like coliseum. My back-up plan had been to do hunters, but it turns out my perfect English-looking horse hates to jump. It’s almost comical but the horse detests it so that plan was out. Ruling out what he couldn’t do; I put everything together that he was good at: calm, not spooky, able to do obstacles, good stop, neck reins. Well, Ranch work pretty much choose itself at that point. Ranch work is the AQHA Ranch Riding pattern #1, and then there is a trail and obstacle portion that is TBD at the makeover. I knew we would look absolutely ridiculous in western tack but I was confident in us as a team to at least not look ridiculous from a skills perspective. So, the choice was made and sealed in stone, no turning back now. By the time the makeover had come around I was feeling pretty good about everything, I didn’t expect Scotty to do super well in Ranch Work, but I knew we at least wouldn’t embarrass ourselves. I was so, so wrong. Scotty was better than I could have ever hoped for. He didn’t spook at one obstacle, even the covered wagon that spooked so many horses. He did pivots, side passes, gates, backing “L’s”, dragged a log, swapped leads, all in stride and a workman-like look on his face. He showed me that he was a Ranch horse, all leggy, lanky, 16.2hh parts of him. He was steady, and brave, patient, and attentive. He was better than a lot of my quarter horses. I was overjoyed by how far we had come, and by how much he had shattered my expectations of what a western horse can be. We get so caught up in conformation, breeding, and lineage that sometimes we don’t give other horses a chance. I made a judgement, and somewhat rightly so, on Scotty and what he was going to be when I first saw him. However, I am so glad that I listened to my horse when he told me what he was good at. I am so happy I didn’t try to force him in a box that he just wasn’t going to fit in. My big, lanky Thoroughbred who is supposed to be a desirable English horse is a big, tall, neck-reining trail boss! Scotty ended up 14th in Ranch Work at the makeover overall and received a TCA (Thoroughbred charities of America) award in Ranch Work for the highest placing horse acquired through a TCA charity. He was the right horse for the job, but he just didn’t look like it at first. 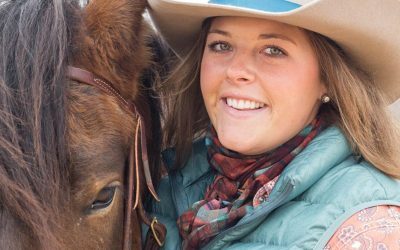 #Righthorse to me means giving horses the opportunity to be great riding or companion partners. 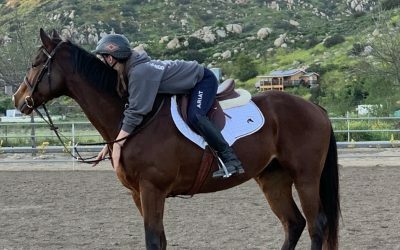 Retraining Thoroughbreds ties directly into this idea, because many of these horses can be wonderful riding horses, they just need the time and care of knowledgeable people to put them on the right track.